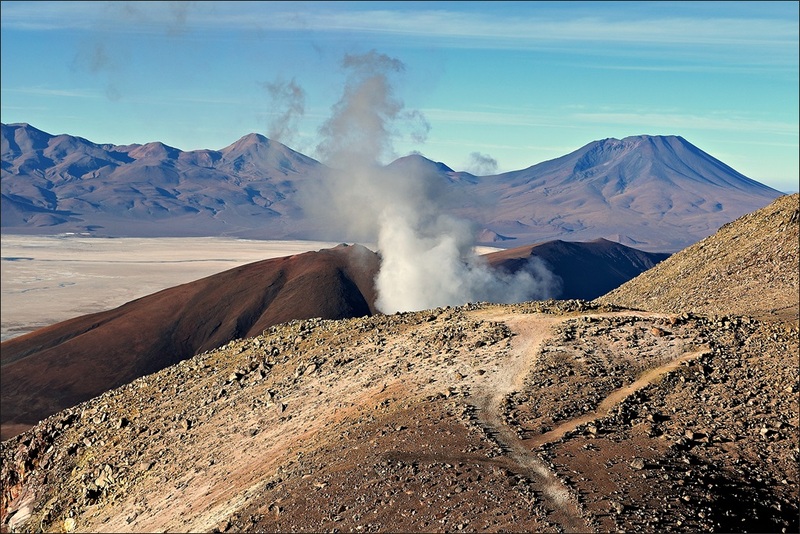 It’s always good to have a spare volcano in your desert – for scenery, for tourists, for sulfur, for energy, whatever – as long as it doesn’t erupt. There are far more volcanoes in the world which have not erupted in the last 10 000 years than those considered presently active. With most of them we will never know whether they are truly extinct or just keep their heads down. And then there are those that constantly wave a flag: Hey, I may have been dormant for a few ten thousands of years, but I’m not dead! Such sign could be some earthquakes telling of magma moving deep down. Or, like in the case of Ollagüe, a couple of permanent fumaroles blowing steam up high as a reminder. 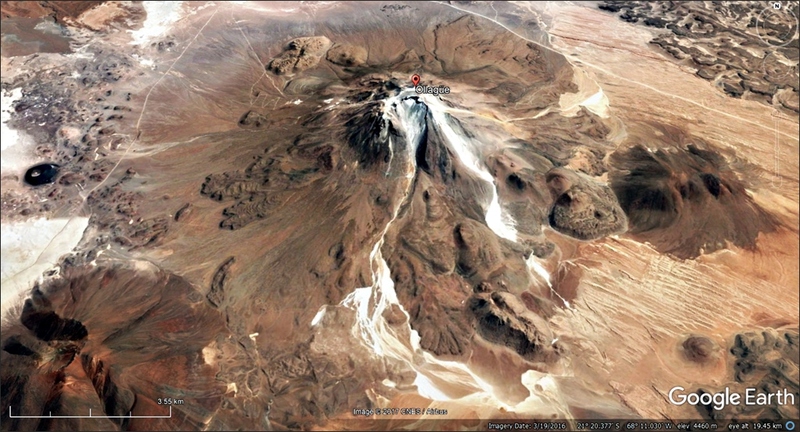 Ollagüe (also Oyahué or Ullawi), with its hight of 5,868 m a.s.l, is a massive andesite and dacite stratovolcano in the Andes. 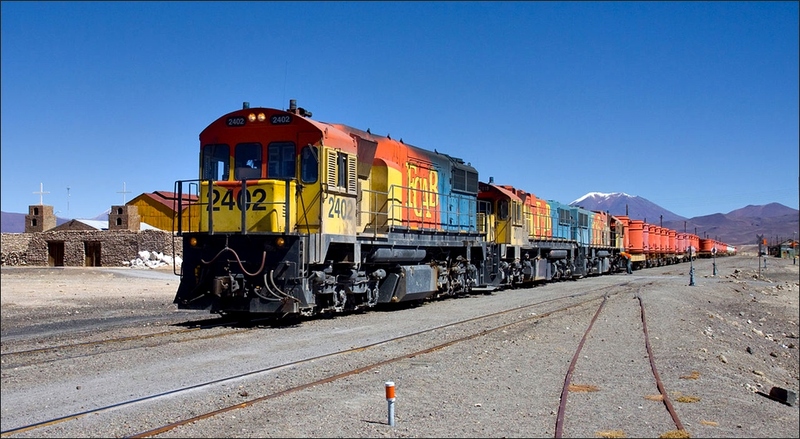 I straddles the border between the Antofagasta region of Chile and the Potosi Department of Bolivia. 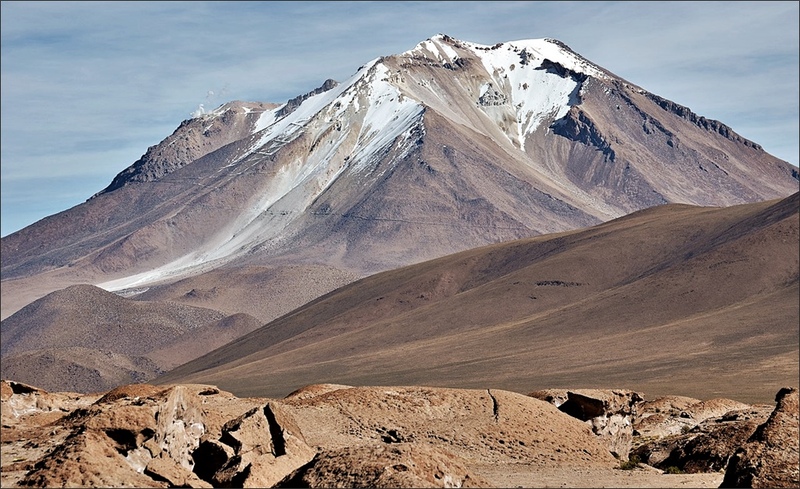 Or, in geographical terms, it sits between the N-S-trending Western Cordillera and the Bolivian Altiplano. Ollagüe is serving well its role as spare volcano: it has delivered its sulfur for ages, and it greatly enhances the surreal landscape of the salt lake plains Salar de Ollagüe and Salar de San Martin Carcote (elevation of ~3690 m a.s.l. 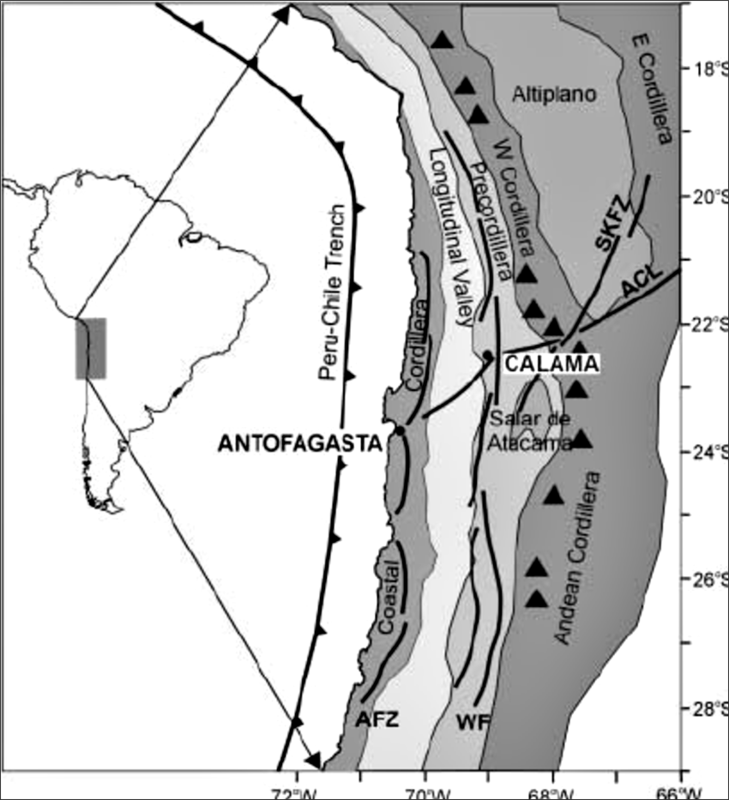 ), as well as the bone-dry and salty grassland (puna) at the edge of the Atacama desert. The area has scarce rainfall and an extreme thermal regime, in which besides human beings only lamas and donkeys have been able to maintain themselves. As you look further around and to the east on the satellite images you also see hundreds of volcanoes, cinder cones, lava flows, collapse deposits etc.. The next active neighbors of Ollagüe are the volcanoes Olca-Paruma, 50 km to the N, and San Pedro, 67 km S.
active volcanic arc, ca. 120 km above the subducted slab and 240-300 km east of the trench. One feature of the volcanoes of the CVZ is that they formed over a fairly thick crust, which can be ~70 km thick. As a consequence, rising magmas re-melt and incorporate a lot of crustal materials along the way, thus producing various types of lava in the volcanoes (crustal contamination; magma mixing and magma mingling). In the Miocene, major ignimbrite eruptions of dacitic to rhyolitic composition started from 23 million years ago. Most stratovolcanoes were constructed in the last 6 million years. They produced much smaller volumes and were formed by magmas with compositions between basaltic andesite and dacite. Ollagüe is capped by a summit crater, 1 250 meters across, that is broadly eroded to the south. There are also two older craters on the summit. The western rim of the main crater is formed by a compound of lava domes, the youngest of which features a vigorous fumarole that can be seen over large distances. One can recognize at least four lava domes that become younger to the south-east. Around Ollagüe volcano some solitary and well-preserved small volcanic centers can also be seen. They are evidence of the great variety of past events: dacite lava domes and flows, basaltic andesite scoria cones, rings and lava flows, as well as a number of silicic lava domes and flows. 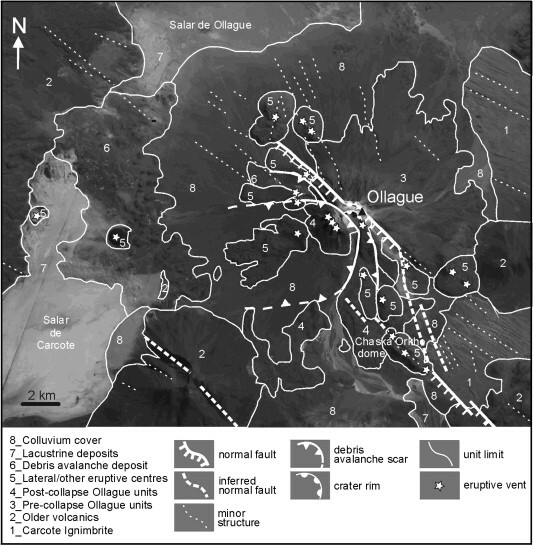 16 eruptive centers have been found on and around Ollagüe, all located along a 4-km-wide strip that crosses the entire edifice from SE to NW. 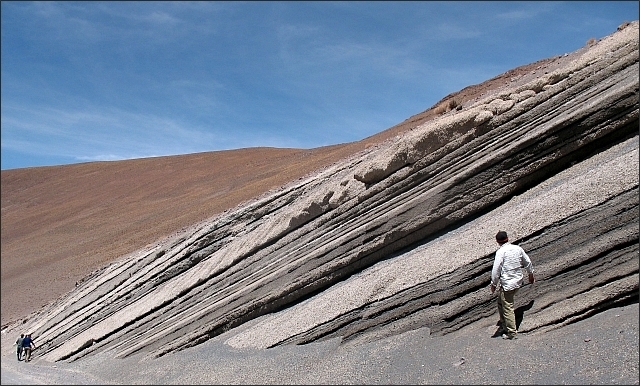 Pyroclastic deposits are very rare in the lava sequences of the Ollagüe cone, indicating that Ollagüe’s eruptive activity was mainly effusive. Three silicic lava flows from late post-collapse eruptions first seemed to be very young, but that was not so: they do show evidence of glaciation and therefore pre-date the last glacial advance at about 11 000 years ago. The volcano is of Quaternary age; it grew upon the 5.5 Ma Carcote Ignimbrite, a tens-of-metre-thick, massive, resistant and lithified deposit. Its geological history has four stages of volcano building, separated by three main events of deformation and lateral collapse of the cone. 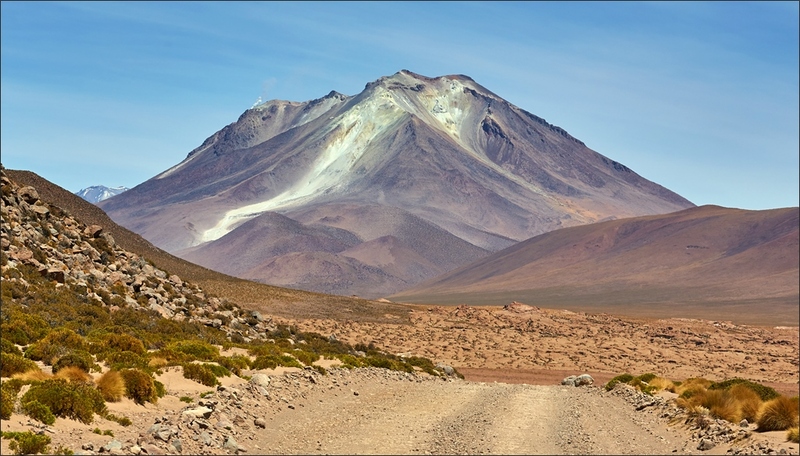 In its main growth phase the volcano piled up andesitic–dacitic lavas and pyroclastic deposits. Later, after a lateral vent pierced the side of the volcano, a collapse of the western volcano sector produced the hummocky terrain of a debris avalanche some 300 ka. Post-collapse lavas, now mainly andesites, were erupted on top of the avalanche deposits. The presently active summit dome grew within the collapse amphitheatre. Northern flank of Ollagüe volcano from Ollagüe village, 02/2016. 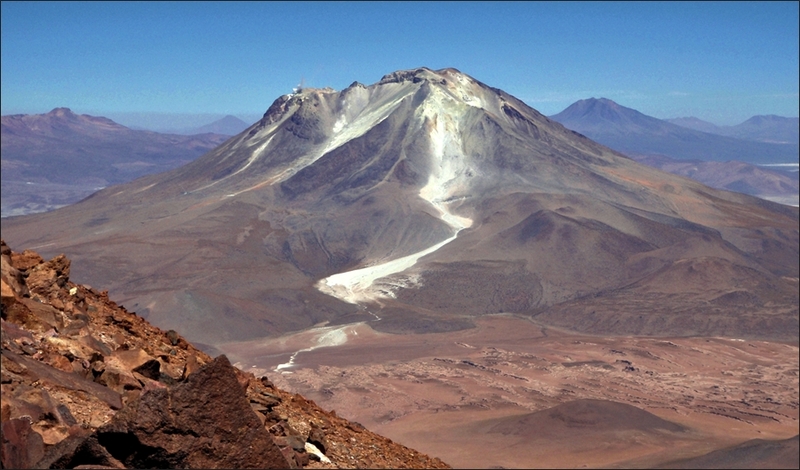 (© Diego Delso, via Wikimedia) Here the “new” lava dome complex can be seen nicely (on the right of the edifice). Research around Ollagüe has much focussed on the flank collapses that have happened probably in three places. During the evolution of Ollagüe volcano, these collapses proceeded from creep-like movements of the flank to the final catastrophic landslide of the SW sector of the volcano. 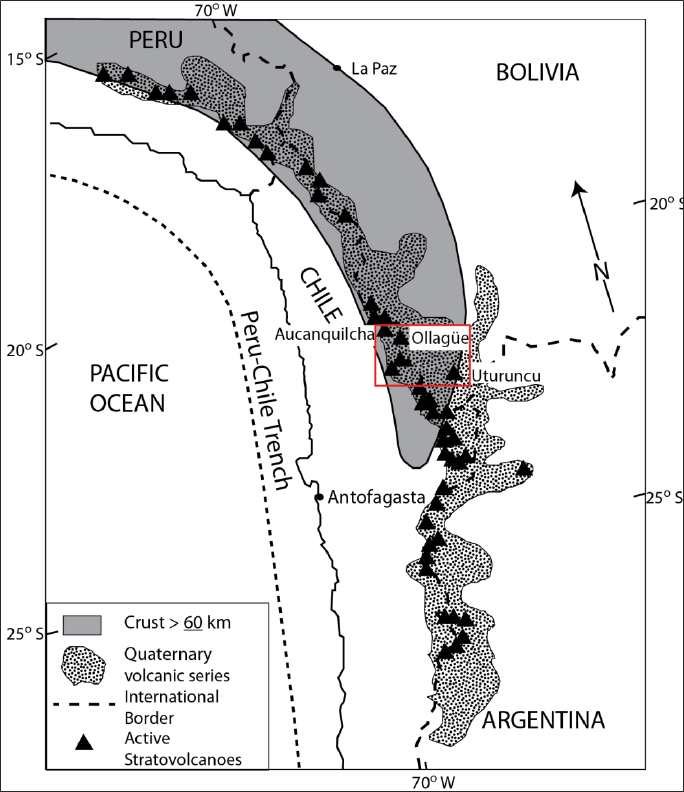 It was found that Ollagüe volcano has grown on a base much affected by extensional tectonics, and that a regional N-W-striking extensional fault system bisects the volcanic edifice. Successive fault offset below the volcano caused an increase in cone deformation and development of fractures. The two older failure scarps on Ollagüe volcano have an unusual trend: they are straight lines – instead of the usual horseshoe shape. No examples had been documented before of flank or sector collapses with such geometry of collapse scars. The reason would have been the fault: As the volcano had grown across the said fault, the latter propagated upwards into the volcanic rock during following tectonic events. So it fractured the mountain inside along the fault’s direction, making it prone to failure with the next eruptions or earthquakes. In fact, it is thought that deformation from rising magma made the cracks slip in the end. IS OLLAGÜE REALLY STILL ACTIVE? Regional tectonics have caused successive deformations and collapses, in short, a weakness of the edifice. This explains geometric and compositional variations in the shallow magma feeding system of the volcano. During Ollagüe’s history, the feeding system shifted from a central conduit to lateral vents along the volcano’s south-eastern and north-western flanks (tree-like shape). 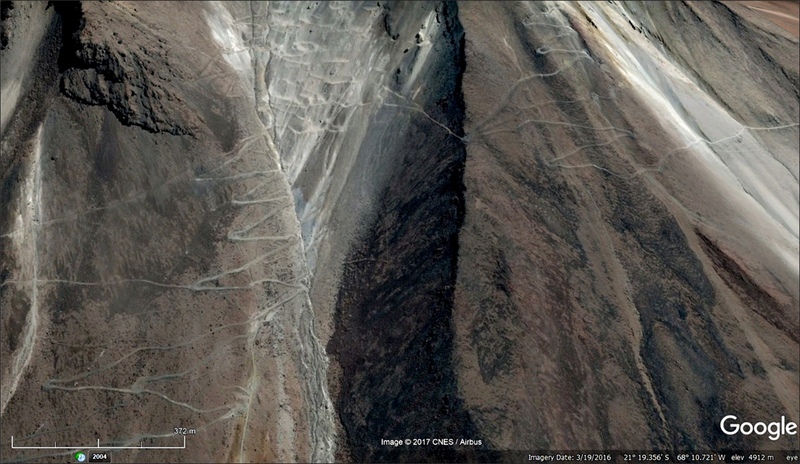 The lateral vents form an alignment with the central summit crater zone, depicting a NW-trending zone of weakness crossing the entire volcano. This zone of weakness is thought to be the expression of a sort of volcanic-rift, linked to regional tectonics. So, we have fracturing by regional tectonics, rifting and multiple pre-historic flank failures creating a new magma system. This all is suggesting that monitoring the volcano for further instabilities would be a good idea. Moreover, the youngest summit dome produces continuous fumarolic activity. It is round-ish in plan view, about 850 m in diameter and 400 m high. Active emissions of gas occur from some fumaroles along a flank-failure wall that have exposed the core of the dome. In 2012, the plume had a relatively low SO2 content. A climber reports a second plume on the summit in 2014. SERNAGEOMIN reports microseismicity is present in the volcano. A reactivation of this volcano would, with high probability, come with an extrusion of domes or viscous lavas. 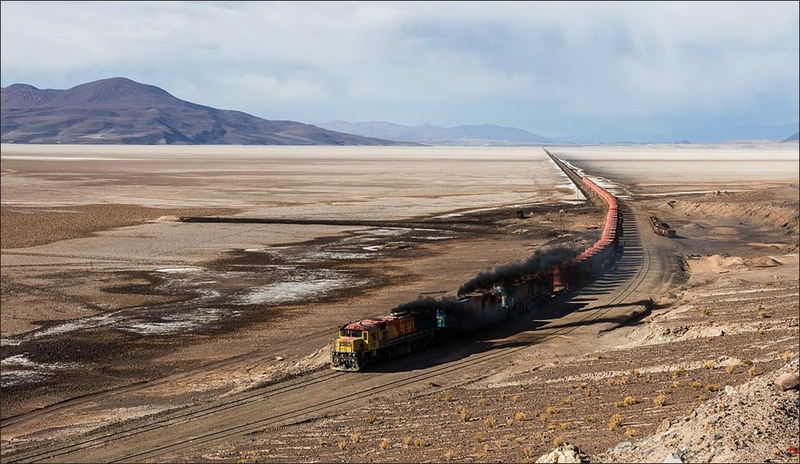 Possible pyroclastic current flows would be mainly directed towards the western flank, where the international route CH-21 is located and the railroad transits to Bolivia. A major eruption, though not very probable, could affect the town of Ollagüe. While none of the usual sources have any evidence of historical eruptions at Ollagüe, one paper (G. Tamburello et al., 2014) state that “The last eruption occurred in 1903”. Also there were unconfirmed reports of activity in 1879, 1887 and 1927. Anyway, with good reason the volcano is considered to be potentially active and is continuously monitored by SERNAGEOMIN. Take a closer look – roads for the mining works have been built all over the mountain. Some of them are still motorable… bloodcurdling idea, isn’t it?! Some of the world’s highest roads go up the mountain in countless serpentines. 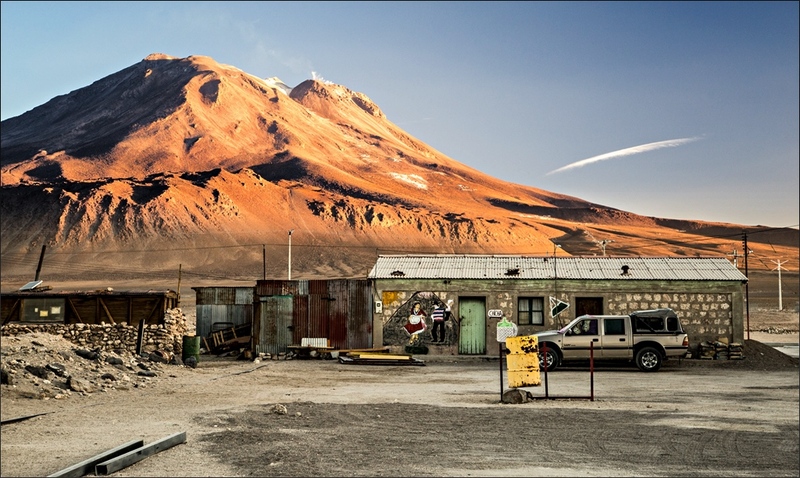 In the western flank of the volcano, one leads from Buenaventura to an altitude of 5672 m. A former miner’s camp can be seen there at 4292 m altitude. Another road leads directly from Buenaventura from the west into the southern flank and there to 5500 m altitude. 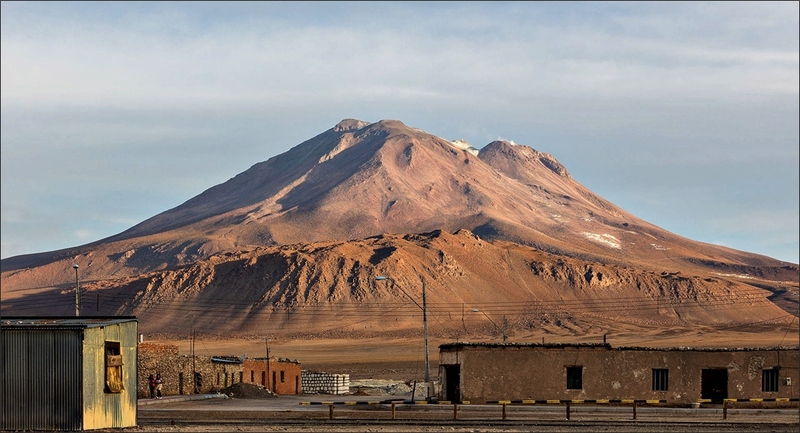 And a third, on the Bolivian side of the railway, goes from the east side of the volcano to an altitude of 5494 m.
Also an 11 km long cableway was constructed for material transport, overcoming an altitude of 1000 m. Just look at the images… and imagine the tremendous amount of back-breaking work that must have been done here! One of several miner’s roads (marked green) leading up to the sulfur works on Ollagüe volcano. 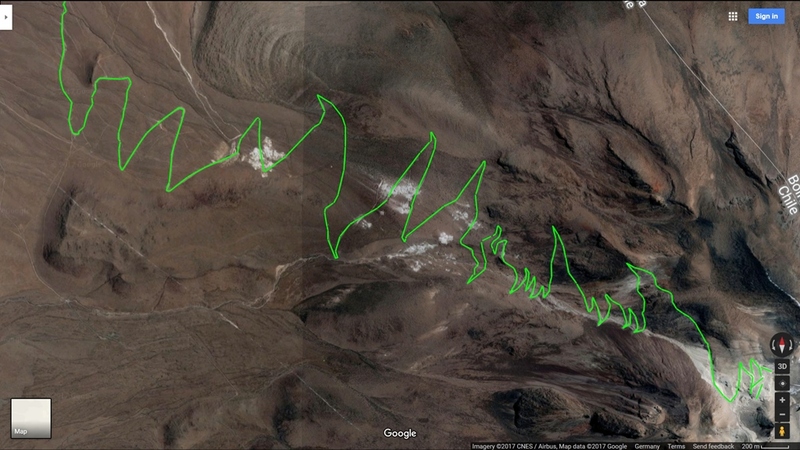 I have measured it – it’s ~20 km (12 mi) long from branching off of a major road to the top of the volcano (Google Maps). The website “DangerousRoads” has a description, images and a video on the descent on one of those roads. “…the road to the summit is an old road on the north side to a disused sulphur mine. It’s extreme. Only 4wd vehicles with high clearance. The road ends at 5.705 m (18,717 ft) above the sea level. This road has humbled many egos. It’s not for the sissies and shouldn’t be attempted by novice drivers. The road is in dreadful condition and requires strong nerves to negotiate it. The gravel road is extremely narrow and bordered by a drop of hundreds of meters (many hundreds of feet) unprotected by guard rails.” This video by ‘venomancio’ kept me glued to the screen for all of its 15 minutes. 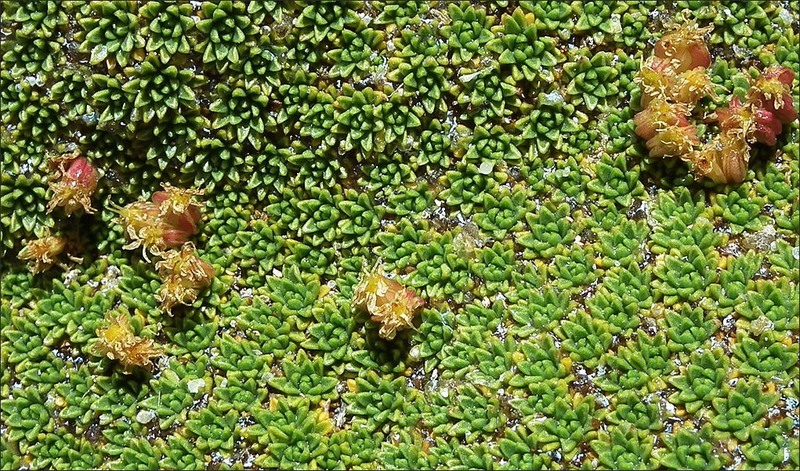 Yareta or Llareta (Azorella compacta) is a tiny but woody-hard flowering plant native to the arid Puna grasslands. 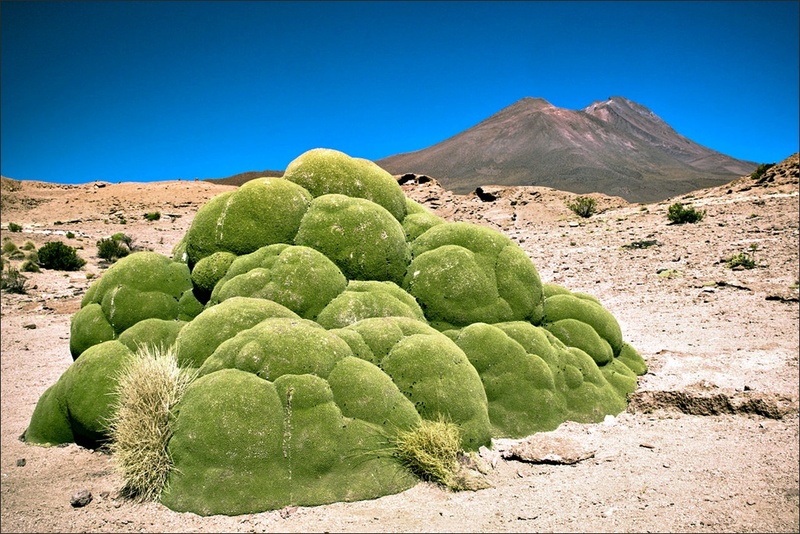 It is found at 3200-4500 m altitude, forming dense mats. It also grows very slowly, at a rate of 1-1.5 mm per year, and thus many yaretas have been calculated to be over 3,000 years old. In those treeless heights, yaretas are collected by locals for heating and cooking, after they have been dried for 6 months. It is also a traditional medicine, and the ash is used as fertilizer. Unfortunately, it was also used as fuel by railways and in the mines. Large quantities of this fuel were needed in the drying process, calcination, smelting, electric generators and in general steam machinery. The plants were collected in an ever more expanding area. From 1915-1958 one of the many nearby mines alone consumed 1000 tons of yareta per month, and so burned about half a million tons of these extremely slow-growing plants. Although the use as fuel is now prohibited, for the local population, there are no alternatives to burning yareta. Decades of stress have markedly reduced plant populations, especially in Chile, and it is now believed that very few of the larger and older specimens remain. More absolutely fantastic armchair reading Graniya! Hope you guys one day get the recognition you deserve! Another very productive little volcano I know little about. And while we are at it. I sure as hell hope they have dialled up the reading on the TMKS seismogram at Agung. It is looking positive frightening at the moment with another intrusion on the way by the look of it. I wonder what depth it has got to? The recent photo via Marc Szeglat’s blog is fascinating. Many thanks to the guy who took it, who was aware of the risks (we are told – he wouldn’t be the first volcanologist to risk their life for this kind of thing). I guess the risk is similar to a snail crossing a highway with medium traffic. It is certain that a car or truck is going to come down the road sooner or later. If it does, you don’t have a snowflake’s chance in hell of getting out of the way, so you will be a goner. If you are lucky though, you can get to the other side unscathed. This guy was lucky and knew the risk he was taking. I don’t have any trouble with that but I do worry about idiots who don’t know what they are doing trying to emulate him and getting killed. We see two things that seem contradictory: A flat lava dome, implying fluid lava, made up of ʻaʻā lava in concentric rings but, secondly, there is an open vent in the middle. How on earth can we make sense of this? The flatness and concentric rings indicate low viscosity which suggests the lava was hot and/or mafic enough to remain flat instead of doming, and it looks like it was effused in pulses of molten mass, which explains the rings. But, despite the low viscosity, it must have solidified enough so as not to run back into the crater mouth when the pressure dropped and thereby plug it. Further, the lava must have been cool enough for the surface to solidify and get broken up as the lava continued its forward creep, creating the ʻaʻā look. Moreover, there are no signs of blocks or bombs in the lava field, at least no big ones, suggesting that the eruption is purely effusive at this stage. Quite possibly the pulses that created the concentric rings correlate with the pulses of strong tremor we saw. If I recall correctly, these did not have any correlating gas/ash cloud, which makes sense. The subsequent puffing is reminiscent of Stromboli and I imagine it is due to vent blockage and regular clearance from small blasts of gas. It is quite fascinating. Obviously this lava has a low gas content, which suggests this is still older lava left behind after the 1963 eruption. Moreover it must be cool enough to create an ʻaʻā field yet not so viscous to create a steep dome, suggesting it is more on the mafic side of things rather than felsic. Always amazes me the vast range of forms that volcanos are capable of. Hi, Bruce, many thanks for posting the link, I’m following Marc on Twitter but it seems he doesn’t tweet his new posts. Hi Graniya, yep, the shape is very reminiscent of Shinmoedake, which had some very explosive burps as I remember as the pancake dome cooled and plugged the vent. So you are right, the shape of this dome does not preclude the presence of gas. But I think this lava is low in gas because there is no sign of any explosive activity (assuming the first ashy phase was phreatic from groundwater interaction). Of course it might simply be that the magma is of such low viscosity that the gas escapes before fragmenting the lava but somehow I doubt it. Rather, I think there is not much gas in this batch. The initial SO2 cloud was most likely from a volume of gas that had gathered in the upper reaches of the volcano over time, i.e. during the magma intrusion and was released in one go during the initial throat-clearing stage, rather than being an indication of the gas content of the magma that is currently getting extruded. If 1963 is anything to go by, the really gassy stuff is still on the way. PS.. I agree with you on the concentric rings being the product of batches / pulses of sticky magma getting injected into an enclosed space (the crater walls) and the ʻaʻā field being from the surface cooling and then moved incrementally by fluid flow underneath it. What is puzzling is why there seems to be a vent in the middle. If the lava is that fluid, why hasn’t it flowed back to cover the vent? The most simple reason might be that there has grown a small spatter/cinder cone around the vent, preventing the lava running back in. Or that the whole “cow pad” is slightly cone shaped – it’s hard to see on the images. My pet idea is that quite strong effusions continued all the time over the “quiet” period, so perhaps no time for clogging up. 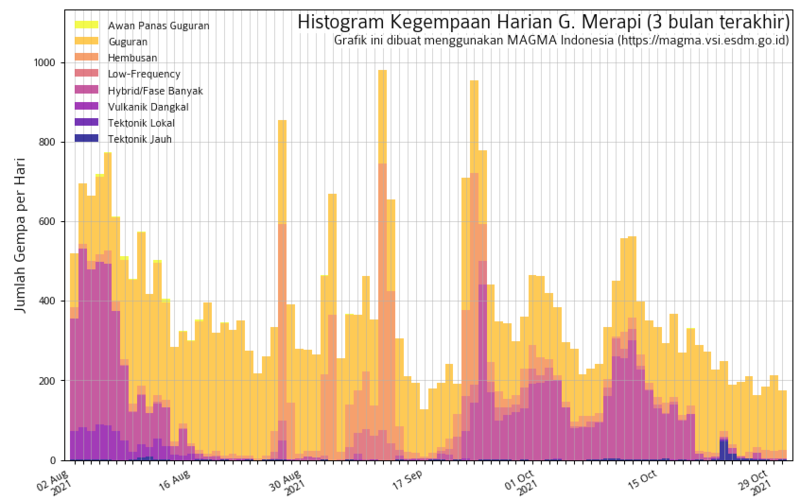 I was really amazed when reports came in, around 7/8 Dec., that the crater should be something like half full already, when there was “nothing happening” for 8 days since Nov. 28/29. Mirova shows thermal anomalies on 1+3+5 Dec., Suomi NPP on 4+5 Dec. The rest may have been obscured by clouds. Also, a distinct cloud of SO2 was tweetet on 4 Dec., I guess strong degassing has been going on all the time. MIROVA, btw., has stopped updating Agung on Dec. 6. It’s so sad that most countries keep their volcanoes under cover like a holy grail, making people guess, speculate and risk lives. This, of course raises the old question in me again: Why then do countries like Iceland and Japan fare so much better by publishing everything, if there’s no point in doing so? We rarely hear of any hoaxes, cries of doom or panic from those countries. Just look at the amount of fake Agung videos on YT! They would not have so many believers if there had been updates with good drone or satellite footage. I really condemn the adventurous photographer for risking the lives of an entire SAR team in the case of an accident, because he must have backed up his trip somehow. But, sure, it must have been the chance of his life to be The First to take those shots, and I can understand that, too. If there had been satellite images as clear as the ones from Planet Lab (link below), there would have been no reason for risky adventures in the first place. Here are more of the bad man’s great pictures. Cool, puzzle solved. There is no open central vent and we are looking at a pancake dome or sticky (basaltic/andesitic) lava lake, whatever terminology takes your preference. Those new pictures tell a fantastic tale. Look at that central vent area before it erupts. You can even see a block that looks almost like a lava spine. I bet this bit glows red at night (and the rest of it a dull red (because of the cooled crust on it). So the vent is open and the volcano can degas relatively easily (which it is doing in steady puffs). The big question is IF new gassy magma will make it to the surface, and if so, how much. Obviously it is still on the move. It could lack the buoyancy to push out this old gas-depleted magma first and the eruption will stall. I wouldn’t be surprised if that is what happens. It could however also follow the pattern of 1963. I’d love to know if the quakes registering on the seismogram are deep quakes or just the occasional blast from the crater..
PS: by open central vent in the first sentence, I mean an open crater like the very first photo we saw suggested.. Of course the vent as such is open, the lava lake is an expression of it! very interesting! I wonder when that caldera formed. 5 km diameter is pretty sizeable. Sounds a bit like McCauley Island further south in the Kermadecs. 🙂 .. ok.. been a while since I wrote anything.. looking into it now. New drone video today of G. Agung. Yes, it is a lava dome, with an elevated center. And the material could be andesite (says Erik K.). That second activity center to the left (WNW), is it just stress related earthquakes or another intrusion? As far as I can see there isn’t a volcano in that area. But then, you never know with the rift, I suppose a new one could spring up in any place. Thank you for your constructing comments. I agree with you about the colors, I still have some (many) things to get better. I’ll try some plot also for Bardarbunga maybe.